Carlo Giuseppe Oddone (1866–1935) began learning his trade at a very young age in the workshop of Benedetto Gioffredo ‘Rinaldi’, working there from about 1880 until Rinaldi’s death in 1888. In 1889 he moved to work for Frederick William Chanot in London. Working at a well-established Anglo–French workshop gave the young man a clear advantage over many of his countrymen, most of whom lacked the opportunity to examine fine violins: restoring and setting up old Italian instruments gave him first-hand knowledge of their models and styles; and interaction with Chanot and other French makers surely prompted the perfectionism that later would become evident in his own making. Oddone returned to Turin in 1892 and began making instruments substantially influenced by the Anglo–French style then so prevalent in England. European taste at that time was partial to the work of Vuillaume, Gand, Georges Chanot and Bernardel, and Oddone used his taste and talent to fuse these influences into a convincing Piedmontese model. During these experimental final years of the 19th century he collaborated with the well-established Rinaldi and Guadagnini workshops, while producing some of his most inspired personal work in the very last years of the century for his own account. By the turn of the 20th century his experiments had yielded a superb and innovative model to which he more or less adhered throughout his career. This fine 1905 example comes from the middle of Oddone’s ‘golden period’, which lasted from approximately 1898 to 1915. 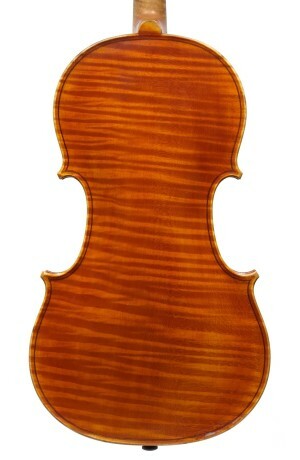 This meticulously made violin boasts all the characteristics associated with Oddone’s mature work. It is made on his own model, which is a successful fusion of influences of the earlier Italian makers that Oddone idolized – Stradivari for the overall impact and soundhole model, and Guadagnini and Rocca for the broad and flat arching that promises a powerful and even tone. The purfling, very carefully inlaid with its two characteristically narrow strips, is set rather close to the edge and ends abruptly at the somewhat elongated, squarish corners. The head is especially characteristic: the stout pegbox is outlined by a black chamfer; the strong, round volute is built without hesitation and contributes to the overall feeling of power to the instrument; it is moderately deeply carved and has a pronounced centre ‘eye’. Particular attention is paid to the edges, the workmanship of which is reminiscent of English and French work of the period – quite square and perfectly finished. The symmetrically constructed button adds a touch of elegance to the otherwise austere outline. Oddone chose a stunningly flamed maple for the back, sides and scroll and an even-grained spruce for the top, and the varnish is a transparent, lustrous orange, generously applied.